Wayne Summerhayes reckons he's got "a pretty good office" as he steers Doris along the canal. FOR about the price of a good cup of coffee you can enjoy a 50-minute round-trip on the Gold Coast's new ferry service. 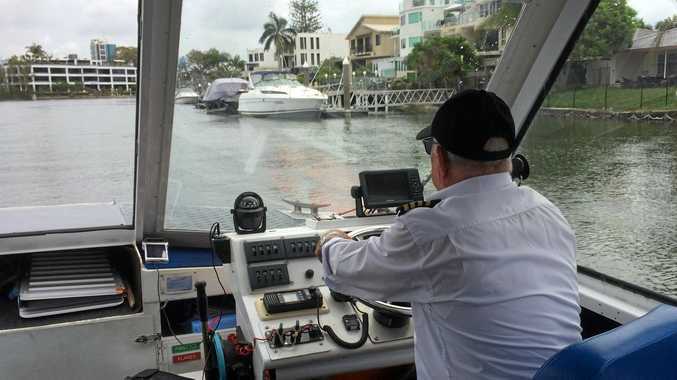 Gold Coast City Ferries is very much in its infancy, having launched in early February, and currently only taking passengers from Isle of Capri to Evandale Park (HOTA) and Appel Park (Tiki Village), Surfers Paradise and return. You can choose to hop on or off at any of the stops, or make a morning of it and do the complete return trip and treat yourself to lunch or morning tea at Capri on Via Roma. That's what a group of four on our trip were doing. The ferry, touchingly named Doris after owner Francis Burgess's grandmother, had attracted a lively namesake - Doris Bergin, who had brought along sister Coral Niethe (who she's trying to introduce to retirement life), 97-year-old mum Mary Mogenson and her friend Joan Clarke, 91. The four were all smiles throughout the trip, enjoying a short burst of speed by skipper Wayne Summerhayes, followed by the slow smooth waters, which allow you to check out some of the huge houses along the canals, jet skiers and other water-users. We didn't meet any dolphins on our trip, but Wayne and co-skipper Paul Matthews, also a former Harbour Master, said they and stingrays jumping were a regular sight. "It's a good sign the waterways are in good condition," Paul said. 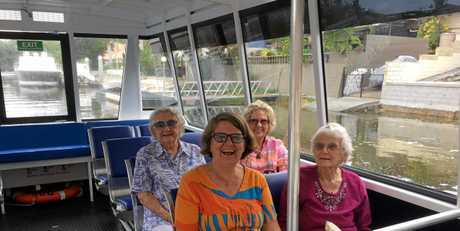 ALL ABOARD: Coral Niethe, mum Mary Mogenson, Doris Bergin and Joan Clarke enjoy seeing a new side of the Gold Coast aboard Doris. A number of his passengers, he said, had commented that they'd never been on the water before. "People know we have beautiful waterways here on the Coast, but the average person doesn't use them; it's a shame," Wayne agreed. Having begun life 30 years ago as a water taxi in Port Macquarie, Doris is just 7.8 metres long, and has had a full overhaul for her new job, making for a safe, quiet and comfortable ride. Still she's a far cry from the ships the Master Mariner skippers have been at the helm of in their combined experience of about 100 years on the water, including 25-metre 250,000 ton ships. As a passenger, you certainly feel like you are in good hands - even more so with the knowledge that Francis is a maritime lawyer, "so every i has been dotted and every t crossed". Most customers so far have been older residents, keen to check out the experience, and families or grandparents with kids, who both men agreed loved being out on the water, as well as a few backpackers and other tourists. While it has taken almost three years to get the service into operation, there are now big plans ahead, provided residents and visitors get behind it. It's hoped to introduce another four vessels and more stops over the next 6-12 months, rolling eventually into up to 38 vessels and 150 passenger stops. A daily express from Runaway Bay, where Doris berths, is currently being examined. Gold Coast Ferry Services is wheelchair accessible and runs Thursday to Sunday, as well as group tours by arrangement Monday to Wednesday. Cost is just $6 a person for a round trip ($4.50 children) and half day rover trips $10 ($7 children). Due to council regulations, you need to hail Doris (like a bus) at Evandale and Surfers, but she will be there. To find out more, or for group bookings, phone 0468 318 997.